Experts warn the “floodgates” of post-traumatic stress are about to open, as a top armed forces charity claims mental health issues among military personnel have risen 26 percent over the last year. Some 2,264 personnel have requested treatment with three-quarters said to be suffering from post-traumatic stress disorder (PTSD) – an average of six veterans per day over the last 12 months. Many are also affected by depression and abuse of alcohol and drugs – symptoms associated with the condition. In a report carried out over the last two years, Combat Stress claims the success rates for veterans on its PTSD Intensive Treatment Programs are around 90 percent. Other groups have questioned the effectiveness of treatments used by Combat Stress, however, which favors methods like Cognitive Behavioral Therapy (CBT) and Eye Movement Desensitization and Reprocessing (EMDR). Martin Webster served in Iraq before becoming a therapist. He now runs the New Leaf Program, helping mentally damaged veterans. He called EMDR and CBT treatments out of date. Speaking to RT, Webster said he wants to see “a coalition of military mental health organizations” that can come together to “look at the academic evidence, see what therapies are available, what has been independently studied” in order to provide the best solutions. He said the treatments commonly in use are inadequate. “Some of the veterans of Iraq and Afghanistan have done more than two years in a conflict zone. That has never happened in human history,” said Webster. Dennis Carlon is part of the independent psychological team that works alongside charity Talking 2 Minds. 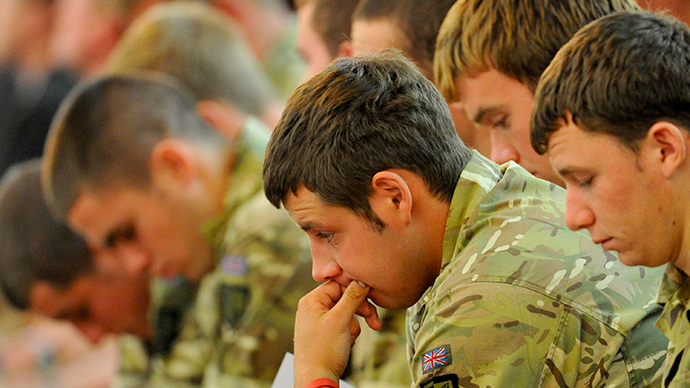 The Ministry of Defence (MoD) maintains the rise in referrals is a good sign – the result of their efforts to increase awareness in the ranks and destigmatize PTSD. Carlon contests the claim, saying while “the MoD have put some effort in,” its record speaks for itself. “The figures do not add up, as normal with the MoD. They are known to lower the PTSD rate [figures]. They simply do not know it. The MoD also suggests levels of PTSD in the military are the same as those among civilians, a claim contested in a 2013 report by advocacy group Forces Watch. “The most recent study of Iraq and Afghanistan war veterans across all branches, roles, ranks and ages found a rate of PTSD of 4.2 percent,” Forces Watch countered. Forces Watch said the MoD was obscuring figures by ignoring factors such as age and social class. “Government statistics showing the average prevalence of mental health problems in the armed forces mask the much greater burden that certain groups shoulder, particularly young people from adverse backgrounds and those who have left the forces in the last decade. Speaking to RT, the report’s co-author David Gee questioned the terms in which the rise has been reported. “No statistician would use number of referrals as a measure of the prevalence of a problem,” said Gee. Gee also echoed the claim that MoD figures routinely ignore the impact of battle stress on different age groups and social classes. “A relatively small proportion of the armed forces are deployed to war zones and then repeatedly exposed to traumatic events. “It is rather artificial to take the armed forces as a whole and provide a percentage of prevalence of PTSD, when what matters more is which groups in the armed forces are most affected,” he said. Gee holds little confidence in the government’s will to address the issue fully.